I was excited about this opportunity because I have met and heard Zappos’ founder and CEO, Tony Hsieh, speak a few times at the Fortune Growth Summit and an EO event. I’ve heard him speak about the culture of Zappos and how their business approach is entirely customer focused. In his best seller, Delivering Happiness, he says that their key to success is giving the customer service reps the freedom to really connect with the customer by spending as much time as they want which each customer. The belief is by doing this, they create a WOW experience for the customer. Tony told a story of being out with friends and wanting a pizza. When they couldn’t find one, the group called the Zappos customer service line and asked them to help them find pizza. Without knowing they were with Tony, the representative said, “Well let me see if I can help you.” By the end of their discussion, the representative had given them several local options for great pizza! Before arriving for the tour, I’d learned that Zappos had moved their offices to a very attractive former government building in downtown Las Vegas. They are currently providing public tours. Our tour included the full campus, from the human resources area, to the call center, to the merchandise buyers, to the group of 40-some people that manage Tony Hsieh’s emails, and even included “Monkey Alley,” where the executives like Tony hang out. We quickly learned what all the buzz was about and why it is such an exciting place to work. The culture they have created is truly amazing. All the areas, even including the human resource area, is in an open floor plan with exposed structure, mechanical and electrical systems. This allow each space to be reorganized and programmed as desired by the users. The space isn’t broken up by walls to allow free flow and collaborative creative thinking. And like the entire campus, “Monkey Alley” and Tony’s desk are open to all. The only person in the company with a true office space is the on-site life coach. Her office is private for the nature of the program and sensitivity of the information shared. She offers a voluntary program to help those that are looking to grow and better their lives. We met with her to hear her philosophy’s first-hand. 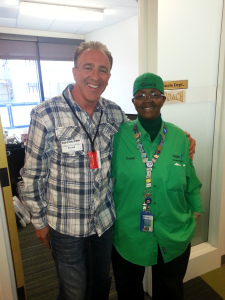 It was very impressive to hear her discuss how she works intimately with people to help them along with the full backing of all resources that Zappos provides. The facility also includes some small, private rooms for quiet phone calls, gathering spaces, referred to as “Think Tanks,” and larger, more corporate conference spaces. They have numerous break rooms all over the building that have a team dedicated to stocking the rooms with healthy foods and drinks that employees don’t have to pay for. For a hot meals, a cafe is provided where meals are purchased for as little as $3. The place oozes with an excited and friendly group of people. As workers passed by our tour, they all spoke to us with welcoming smiles. It was obvious that they were very proud of their work place and wanted to share with us the environment they get to enjoy on a daily basis. 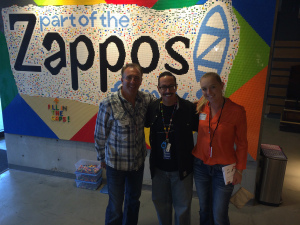 If you find yourself in the Sin City, you will not be disappointed if you make the opportunity to stop by and tour the Zappos’ headquarters.